Drug busts are nothing new. They might make the news if they’re particularly interesting or spectacular, but for the most part it isn’t all that Miami Vice made it out to be. Sometimes, it’s just a couple of goofballs looking to supplement their income by running weed up and down the River Thames. But there are events set into motion that go a little deeper than the average pot delivery. When the weed in question shows certain qualities not generally associated with getting high, and when those qualities display a connection to magic, the fine lads of London’s SAU get involved. I’ve got a confession to make… in the past, I’ve avoided Rivers of London because it just seemed like there was too much backstory to make getting on the bus this late in the game doable. I’m going to say with all confidence that, from time to time and on rare occasions, I’m an idiot. Sure, Rivers of London has a pretty deep history, which includes six novels from author Ben Aaronovitch, and an ongoing comicbook series from Titan, and I’d be lying if I said that there wasn’t any catching up to do. What I will give by way of assurance to prospective readers who may be apprehensive about picking up the series in progress is that it could be well worth the time. I have not read the novels, and this may only be the second time I’ve given the comic series a look, but I think I’m in. Based on what I’ve read so far, the world created by Aaronovitch embraces everything that’s good in the genre of urban fantasy. His inclusion of mythology as a part of everyday living gives this world a spin that often gets overlooked (that meathead in the clothing store would have to think twice before spouting off about seeing an attractive woman in a bathing suit, because she just might be capable of doing more than giving a slap in the face by way of reprisal). 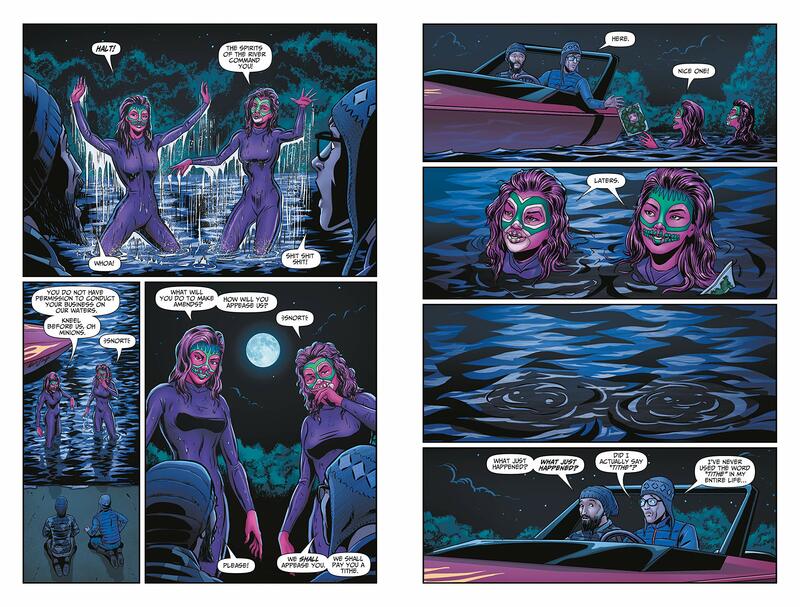 And now writer Andrew Cartmel has adapted the already layered world of Rivers of London into the equally layered medium of comics. Not having read the original books, I can’t testify to the accuracy Cartmel brings to the existing characters. What I can attest to is that as they’re written here, these characters are all interesting and three dimensional… some could even be said to be “cheeky” and “full of piss”. Just as Detective Peter Grant isn’t written just as a hard-nosed enforcer of the law, Cartmel has made sure that the ancient beings normally known as “supernatural” come across as more than simple nymphs and goblins. It’s as though Cartmel understands that an immortal who’s lived through the centuries wouldn’t be stuck in outdated patterns of speech or hung up on ancient clothing fashions. In that sense, the artistic team has done a great job of presenting the people of modern London living side by side with what may have at one time been considered deities & demigods. Lee Sullivan has populated Rivers of London with normal everyday folk, doing normal everyday things… something that isn’t seen often enough in a medium overrun by costumed vigilantes, super patriots, and people able to leap tall buildings in a single bound. Sullivan’s people could be anyone walking down the street, heading to the shop, or as is often the case in this book smoking a blunt… right up until the moment that they’re not, when they become something a little more. 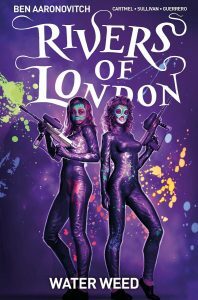 Putting the polish to Sullivan’s illustrations, Luis Guerrero & Rob Steen have added their touches to Rivers of London. Guerrero’s colors may not be flashy, but that seems to be the point… the world as its portrayed here is full of the fantastic and the outrageous, and the use of an effective, not overdone, color palette seems to reinforce the fact that wizards and goblins don’t require more flash than that. As a colorist, Guerrero has a done a fine job of filling in the world, adding depth without overdoing it. For that matter, Rob Steen’s lettering is totally in keeping with the overall theme- it doesn’t have to be BIG to be effective, and a letterer whose work pulls attention away from the characters and their story hasn’t done their job well at all- all respect due to the letterers… the unsung heroes of comics. I read somewhere that the bubbles we get from soap serve absolutely no purpose whatsoever, that originally soap was pretty much suds-free. Studies showed that consumers just liked to see something in return for their hand-washing efforts, and a good lather seemed to do the trick even though it didn’t do anything. 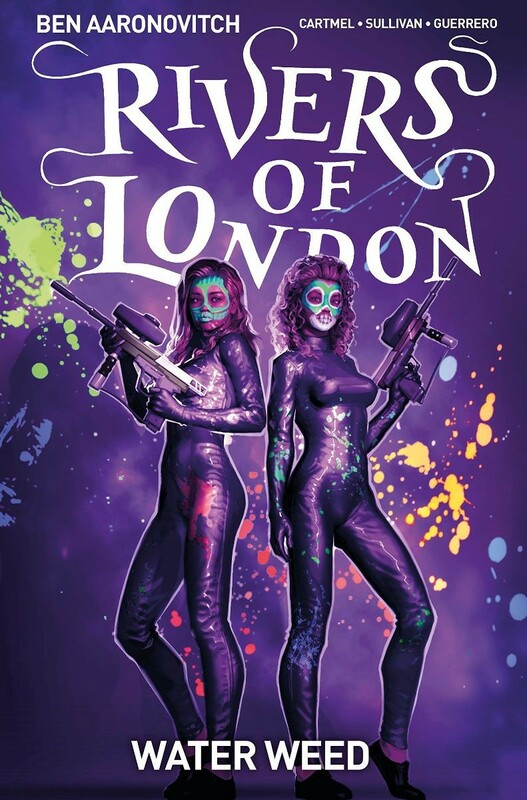 So, in Rivers of London readers are a given a world where the fantastic and extraordinary are right out in plain view, and a cast spell doesn’t have to be all thunderous booms and lightning bolts. A solid, well-told story is more than enough.